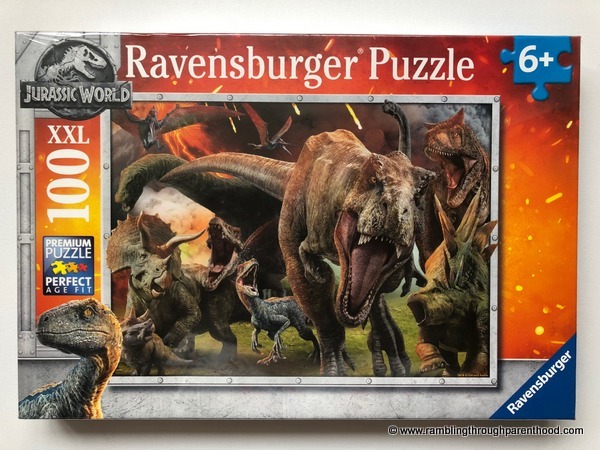 Ravensburger have come out with a brand new dinosaur jigsaw to mark the release of the new Jurassic World: Fallen Kingdom movie. 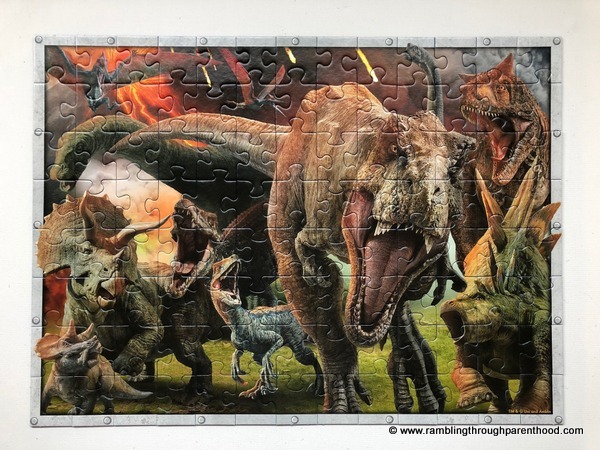 It features a ferocious t-rex, triceratops and velociraptor and other fearsome dinosaurs as the puzzle picture. Ravensburger are known for their quality products (we have reviewed the 100 piece Despicable Me 3 puzzle previously), and this jigsaw is no exception. The pieces are a great size, sturdy and made from what looks like fairly durable cardboard. The printed picture has a linen finish that minimises glare on the image and offers enhanced picture clarity. This jigsaw is made up of 100 pieces that link seamlessly, and measures 49 x 36 cms when complete. I attempted making this jigsaw solo. Putting it together wasn’t as easy as I had anticipated. The border was easy enough to put together because the image is essentially a framed picture of dinosaurs. So it was a matter of piecing together the frame to finish off the border. The stud feature along the edge was an added help. The top two lines fell into place with ease, thanks to streaks of orange and red flames that guided me. It was the greens and browns in the middle that were tricky to decipher. I had to step away for a bit and come back to it. A break, a relaxed mindset and a refreshed outlook was all that was needed to piece together the remainder of this Jurassic jigsaw. The completed picture is striking. The colours are vibrant and the attention to detail is amazing. Given my experience, I am not entirely convinced by the 6+ guidance on this puzzle. 6 year olds will need assistance from a grown-up to finish solving this jigsaw. Unless I am mistaken and am grossly underestimating the capabilities of six year olds! 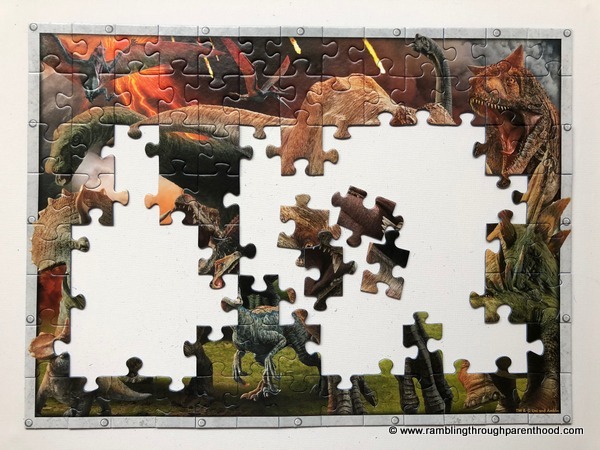 Anyway, if you like jigsaws and dinosaurs and are looking for a challenge, this Fallen Kingdom puzzle is just the thing. Disclosure: I was sent this puzzle for the purpose of this review. All opinions are my own.